Skateboard flip tricks are modern skateboarding. Flip tricks are what has made skateboarding popular. Skaters jump and the board flips using only their feet? What? That looks so cool. Seems impossible even when you see it before your eyes. Believe me it is possible. Read on the see how. This is called technical skateboarding or flip tricks. There are a few variations of what I call flip tricks. Once mastered you can combine them to make more tricks. In some cases you can make an entirely new trick buy putting two different tricks together. The names get pretty technical but don't worry. I explain them one by one. It will fit together. Giving you a chance to learn a new trick and then move up to an even more difficult one. 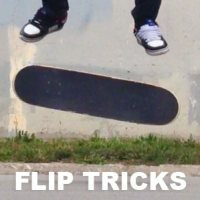 Here is a list of major flip tricks to learn. Trust me, there are many more. Starting with these will keep you buy for a while. After the list I say what each flip type is so this all makes more sense. Combine these together to make tons a lot of awesome skateboard tricks. A shuvit is not really a flip trick. The board does leave your feet. A shuvit is when you do a flat spin with the board. You can do it 180 or for more advanced 360 or 540(good luck ;). They can be done backside, frontside, nollie and fakie. They can be done with no pop, a lot of pop or even late. Shuvits are underrated and underused by skaters everywhere. Flips are the most popular skateboard tricks. You can do a flip with your toe, called a kickflip. Or a flip with your heel, called a heel flip. You can do them in any stance. If you are really good you can try them with any foot or as a late flip. Doing a flip or shuvit while doing a 180 or even 360. These tricks will have a frontside or backside in the name. This combines the ollie spins with a flip trick. Making a whole new trick. Sometimes the name is shortened. Instead of saying a frontside 180 degree ollie kickflip. You can say a frontside flip. That is the basics of the flip tricks. There is much more to learn if you want to. Starting with this knowledge you will know more than a lot of skaters out there.